I am super extra excited today. I just love the Surprise Recipe Swap because I like finding new recipes and trying them out, for not only Wee Bear and I, but YOU! This is our third month and third swap! If you want in, the details are at the end of the post, just click the SRS button! We always post on the 20th of the month, hence, why I didn't post yesterday. In the meantime, let’s talk about who I am blogging about this month! Her name is Michelle and she has this sweet blog called Michelle's Tasty Creations! Michelle is a stay at home Mom who lives in California. She fell in love with cooking at a very young age and was fortunate to carry on the "Good cooking and baking Gene" from her Grandma. 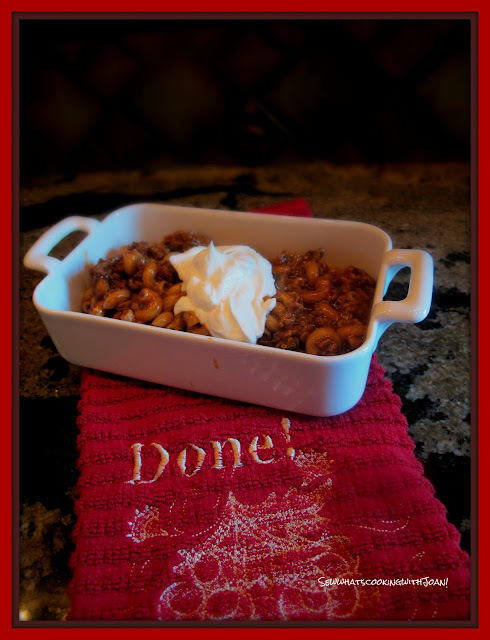 She decided to start her blog so she could pass on recipes she created or tried. She is doing a great job! 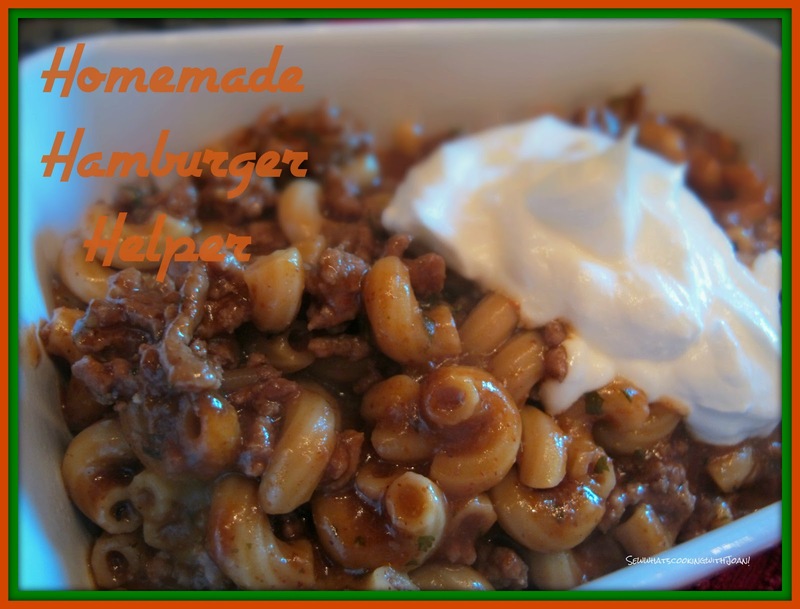 I looked over her recipes, which there are many, and knew right away, that the Homemade Hamburger Helper was the one for me! I know my friend Jane is giving me an eye roll on this one, but let me explain.....giggle giggle! I left for my yearly Pearl Laguna retreat a couple weeks ago. I was gone 6 days......that's 6 days that Wee Bear ate alone or with friends. I always make him a few special dishes that he can heat up and a big pot of spaghetti. Before Wee Bear met me, Hamburger helper was his "go too" meal. He used to make it, every time his kids came for visitation weekend! They loved it too, I think Laura and Paul will ponder some fond memories when they see this recipe! This is what I made for him to enjoy, along with a couple other dishes while I am, in his words, "getting my A-- handed to me" at my hiking/yoga/cleanse retreat! He loved it, did not eat the other dishes I made and had the Homemade Hamburger Helper almost every night! Wee Bear ...happy Bear! And not from a box with ingredients you can't pronounce the name of! In a bowl mix all the spices and set aside. 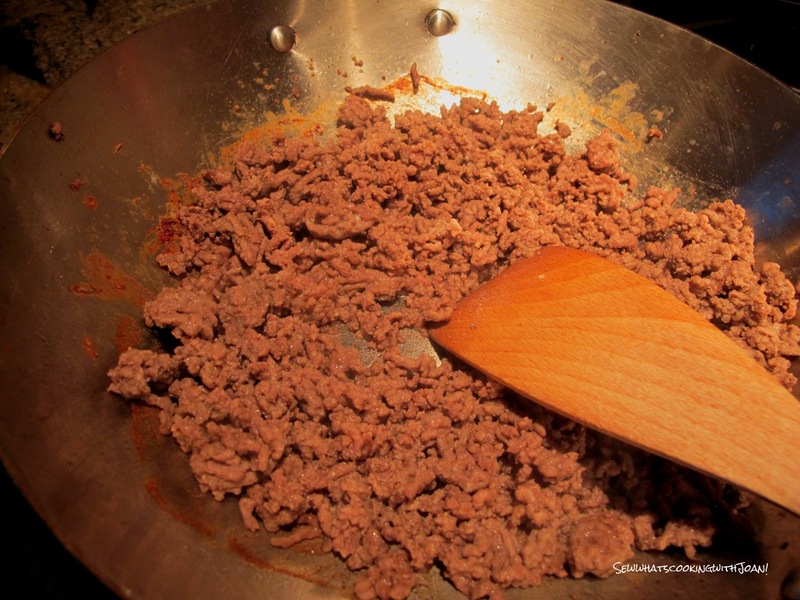 in a large pan or stock pot, brown ground beef on medium high until completely cooked. Add the spice mix and stir to coat the meat. Add the tomato sauce and stir to combine. Add the chicken stock and water, mix well. Add the macaroni and stir to combine. 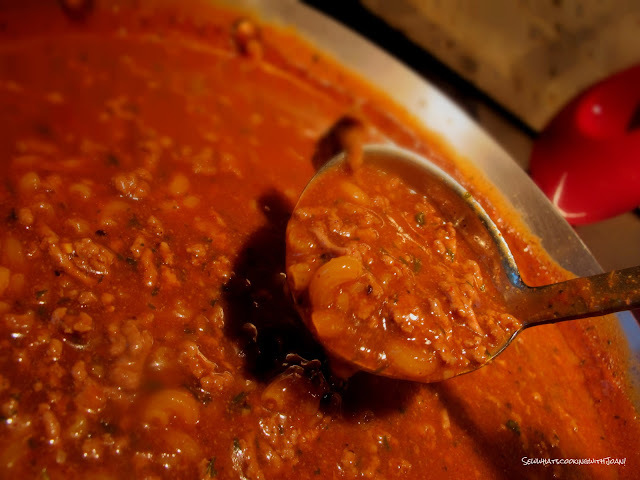 Bring to a boil them reduce to a simmer and cook covered, for 15 minutes or until the pasta is tender. Be sure to stir every few minutes so the pasta doesn't stick to the bottom of the pan. Michelle suggests serving with bread and a salad. Wee Bear was really happy and surprised!! If you would like to participate in the Surprise Recipe Swap, we would love to see you!! It is a lot of fun! SRS link will take you to Jutta's site! What a great recipe pick! I love homemade things, especially when the store-bought product is so unhealthy! Thanks Jutta! Wee Bear loved it!! Short Rib Ravioli with Mushroom sauce! Thumbprint Peanut Butter Doggie Treats! Cornish game hens with herbed Quinoa stuffing! Chicken Marsala for Wee Bear! Homemade Pumpkin & Fruit Dog Treats!